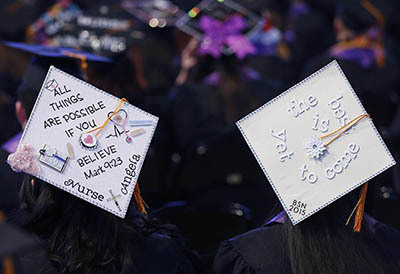 Grand Canyon University’s winter commencement Friday packed the Arena to the rafters with more than 600 traditional graduates in the Class of 2015, 4,000-plus guests and the usual amount of purple-laced, celebratory spirit. But for one graduate it went far beyond that — all the way to the Holy Spirit. His name is Deven Anderson, and his story needs to be told to be believed. 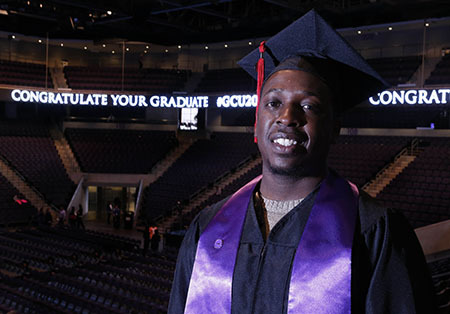 Anderson, 32, received his degree in Christian Studies 2½ years after enrolling at GCU and four years after serving a decade in federal prison for robbing more than a dozen banks. Left to fend for himself in west Phoenix after his mother died when he was 14, Anderson turned to the gang life before eventually getting caught. He landed in the correctional institution in Victorville, Calif., in a cell with a Hispanic man who didn’t speak English. But the man’s actions spoke in a very decipherable language. Six days later, another man came into the cell. He was heavily tattooed and certainly looked like an inmate. But after a few minutes of nervous conversation, Anderson learned he was a prison clerk who was a Christian and had felt called by God to visit that particular cell on that particular day. He invited Anderson to pray; his Hispanic cellmate was so joyous, he started jumping up and down. 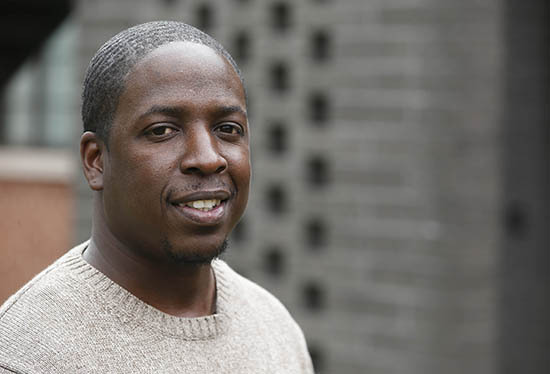 Anderson had been passing time in prison writing rap music, but now declared himself a Christian artist. He stopped cursing. He earned his GED and took college-level courses. Spin forward to his post-prison life. Anderson got married — he met his wife, Holly, after a Godly mysterious set of circumstances led him to meet her brother in prison. He and Holly manage a tax office, and he designs women’s clothing and writes and performs Christian rap. Anderson wanted to obtain a college degree, but everywhere he went he was rejected because of his past. And then, Holly suggested GCU. He got to his GCU interview, and the inevitable question about his background came up. He couldn’t believe the reaction. Now that what he calls his “peaceful” GCU experience is ending, Anderson is “at a crossroads.” He has an intense desire to learn more about Christian apologetics. He’s thought about becoming a pastor, but he respects the difficulty of that job. “He has a heart to minister to people,” Kreitzer said. As for his next step, Anderson’s leaving that up to God. “I believe that God has placed me right here for a reason, but I don’t know the reason,” he said. Maybe the first thing to do is to stop for a minute and just jump for joy. It’s becoming part of what we look forward to most at commencement: President Brian Mueller’s short-and-sweet address. “The December graduation is such a phenomenon,” Mueller told the graduates, many wearing glittery, ribbon-adorned mortarboards (you know who you are, future nurses) and happy guests who grabbed nearly every spare seat, floor to ceiling, in the Arena. “It’s grown so large that we decided to study the students graduating in December versus the students graduating in April. And without question, the students graduating in December have turned out to be, by far, the best students ever to attend Grand Canyon University,” he quipped. Mueller introduced keynote speaker Erik Wahl, a graffiti artist/author/entrepreneur/philanthropist, who speed-painted two large canvasses, a striking eagle and a white-on-black piece that eventually was revealed to be an upside-down portrait of the late Apple co-founder Steve Jobs. Wahl told the audience he loved art as a child until a teacher told him that he wasn’t very good because he colored outside the lines and didn’t color apples red and pumpkins orange. He took it to heart and stopped making art, focusing instead on good grades and a business degree from the University of San Diego. Success came in the corporate world. But due to a “series of events that rocked the core of my foundation,” Wahl found himself in a financial free fall. “I had allowed my self-worth to be directly tied to my net worth,” he said. A friend suggested travel, but Wahl had no money. 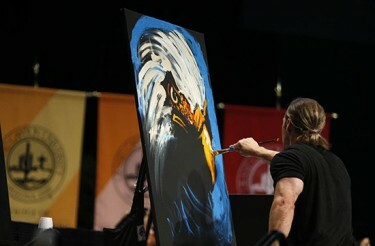 Instead, he bought paint and a brush, and his creativity, suppressed for 20 years, returned. Turning his attention to Jobs, who once told a Stanford University graduates to “stay hungry and stay foolish,” Wahl said the technology genius had it right. Alexa Pawlak, 21, isn’t just one of the outstanding biology majors who graduated Friday. The future dentist also is the first student to graduate from GCU’s Honors College. “This is a huge milestone for the Honors College,” said program manager Breanna Naegeli. Alexa Pawlak is the first student to graduate from GCU’s fast-growing Honors College. The college was only two years old when Pawlak transferred to GCU from Mesa Community College. It has grown from 59 in the fall of 2013 to 750 this school year, Naegeli said. Pawlak is the first, but about 40 other Honors College students will graduate in the spring, and many will have completed a bachelor’s degree in three years, Naegeli said. “It’s wonderful to see our students’ hard work, dedication and diligence pay off,” she said. Pawlak was as surprised to learn she was the first honors student to graduate as she was to discover two years ago that she loved honors classes. She was reluctant at first because she thought the designation would signify additional busy work. As it turned out, she did have extra work and tests — like her final Thursday that included in-depth essay questions in addition to the standard multiple choice questions. But she thrived on it. One of her favorite classes was genetics, a class she wasn’t initially excited to take. “I ended up writing a paper on disease and it took me the whole semester to do it. It’s a disease I’m a risk for and it was a great learning experience being able to really work hard on something that was meaningful to me,” she said. Pawlak earned a biology degree with an emphasis in pre-medicine from the College of Science, Engineering and Technology and is headed to dental school. She has been accepted into four schools, and is torn between Midwestern University in Glendale and the University of Pennsylvania School of Dental Medicine in Philadelphia. She has known she wanted to be a dentist since she was in 10th grade, but it wasn’t until 2012 that she became a Christian and decided to attend GCU. Serving others has been a constant for Angela Rodriquez. The Albuquerque woman joined her city’s police force when she was just 18, retiring 20 years later after an impressive career in law enforcement. On Friday, Rodriguez graduated from GCU with a bachelor’s degree in nursing from the College of Nursing and Health Care Professions. She hopes to work in the emergency room of a Level I trauma center or specialize in psychiatric nursing once she has been certified by the state of New Mexico. Starting her career at a time when there were fewer than four dozen women in the Albuquerque Police Department, she was the first female assigned to its gang squad and the first woman named as a SWAT team negotiator. In between, Rodriguez was a motorcycle cop for 10 years and gave birth to two children, too. Following her retirement in 1998, Rodriguez moved to Washington, where she was a hospital volunteer for several years, working with doctors and families of patients on the surgical floor and holding babies and playing with children in the pediatric unit. “I was so impressed with the nurses I worked with, and I thought, ‘This is something I could do,’” she said. Returning to New Mexico to be nearer her aging parents, Rodriguez learned that several friends were enrolled in GCU’s nursing college. 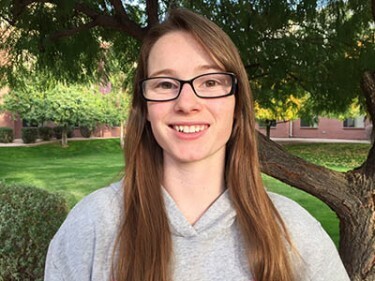 Her first phone call, to admissions representative Scott Bogart, sold her on the University, and she enrolled in ground classes at the Albuquerque campus in August 2014. There were just 20 other students in her cohort. Rodriguez most enjoyed her courses and training in surgery and psychiatric nursing and found her passion for emergency room work during her clinical experience at Albuquerque’s only trauma hospital. As vice president of the Student Nurses Association, she helped plan many events to benefit the March of Dimes, the Ronald McDonald House, and Joy Junction and other homeless shelters in Albuquerque. Ultimately, Rodriguez would like to work with Doctors Without Borders, traveling the world to help provide emergency medical care to people in crisis. It’s her calling, she believes. “God is the reason I’m here — He led me to this profession,” she said. For many students, landing a job after college is stressful. But Emma Kinsella is anxiously waiting to settle into her own classroom following graduation. 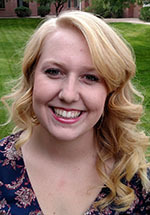 Emma Kinsella graduated from the College of Education with a dual degree in elementary education and special education. 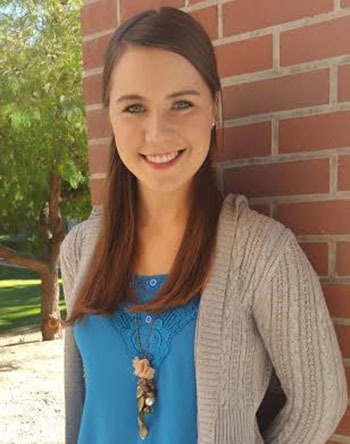 During her last semester at GCU, Kinsella spent more than eight weeks student teaching in the Alhambra Elementary School District, just blocks from the University’s campus. She recently accepted a full-time position as a cross-categorical resource teacher, instructing students with varying needs at Westwood Primary School in Phoenix. The 21-year-old, who graduated Friday from the College of Education with a dual degree in elementary education and special education, said she is preparing by gathering beneficial materials for her classroom and reviewing student files to learn about their individual goals and education plans. She didn’t set out to be a teacher, but is glad life happened that way. Her initial foray into the world of teaching took place while she was a middle-school student in the gifted and talented program. Kinsella volunteered every week in a kindergarten special education class, and there, she met Gavin, a student with autism who would direct her life. Because Gavin would get so easily overstimulated when she and her classmates arrived, she spent a lot of her time doing activities with him on the playground. A unique bond was created and, eventually, the boy learned to make it through an entire day with Kinsella by his side. He even learned to speak. “Both his teacher and mine said that they had never seen him grow so fondly of someone as he had with me, and I grew just as attached,” Kinsella said. Although Kinsella worked closely with various students in different classroom settings throughout middle school, high school and college, she believes it was Gavin who made it easy to discover her passion: to really help students like him shine. “Watching the amount of growth and progress that Gavin made that year and being just a small role in that growth sparked a passion of mine that would remain for the rest of my life,” she said. Like many freshmen, Kaitlin Swanson was struggling a bit — but not academically. Instead, the small college she had chosen in her native Minnesota wasn’t making the grade, in her mind, so she started thinking about what else might be out there. The faculty and staff in the Colangelo College of Business is sad to see Kaitlin Swanson go. A chance encounter with an advertisement for GCU got her thinking about a campus in Phoenix that was bigger and growing quickly. Oh, and there was one other important factor. “It was warm here,” she said. Not long after, Swanson brought her sunny disposition to GCU’s Colangelo College of Business for her sophomore year. But she was just getting warmed up figuratively as well as literally. Early in her junior year, she initiated a meeting with Dr. Randy Gibb, who had arrived as CCOB’s new dean a few months earlier, to find out his plans for the college. That same day, she was hired as an administrative assistant in the CCOB office, and when she graduated Friday with a degree in Business Management she was sad to be leaving an office and a campus that had become home. Swanson would love to go into business consulting and “understanding how people work,” but the first step for this new alumna is to spend the next five weeks at her home in Anoka, Minn., and do some work for a manufacturing company and a nonprofit. Then she plans to go on a 2½-month trip to visit her aunt and uncle in England. She’s looking forward to enjoying a white Christmas again. But after that? Not so much. “I’m sure it will snow twice and I’ll want to come back,” she said. Iliana Swartz didn’t start acting until she was a teenager, but she has since made up for lost time, delivering memorable stage performances as the Cheshire Cat in “Alice in Wonderland” at Coeur d’Alene (Idaho) high school and as Aunt Eller in GCU’s sweeping “Oklahoma!” last spring. Swartz told herself she would stick to her education degree, but the lure of the theatre was too great. 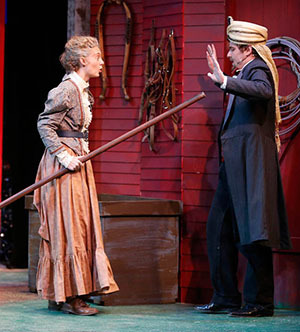 After being selected in 2013 for the ensemble in “The Cherry Orchard,” Swartz switched her major to theatre and drama. She graduated Friday with a bachelor’s degree from COFAP, just 3-1/2 years after starting school. She did several internships, worked on campus for the busy Event Services audio-visual department, and had an assignment in all 16 mainstage shows, whether acting, stagecraft, lighting or stage management. “I had very little sleep,” Swartz, 21, said of her time on campus. She was assistant stage manager for “Sherlock Holmes: The Final Adventure,” in 2014, and most recently was stage manager for “Die Fledermaus,” an opera presented by COFAP in November. But it was in “Oklahoma!” that Swartz, who got a callback on a part she never tried out for, demonstrated her comedic talents. She was cast as Aunt Eller, a sturdy farm woman with a big heart who also could be tough. Swartz also directed two plays that were part of COFAP’s student-run “second series” program, and was a student worker in Event Services’ audio-visual department. She helped set up light and sound for many campus events, including her favorites, GCU music concerts. Although she’s good at it, acting is not where Swartz sees her future. Rather, her internships at Phoenix Theatre, the Herberger Theater Center, Tempe Center for the Arts and Chandler Center for the Arts have honed her love for backstage work. For now, Swartz plans to return home to Texas and learn American Sign Language because she feels strongly that those who are hearing impaired also should enjoy the theatre. Andy Baughman’s life has been one great big canvas, and he continues to dream in color. 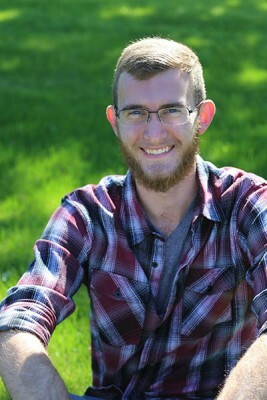 Until two years ago, Baughman, who majored in digital design with a focus in animation, had no expectations to go back to college after obtaining his associate degree from Tacoma (Wash.) Community College. Baughman was working for an aluminum company in Chandler to provide for himself and his two siblings after moving to Arizona. All three had been raised in a missionary family in France but were encouraged to pursue a new future in the United States while staying with extended family and investing in their relationship with God. Then a close friend urged him to take a tour of GCU. One look at the campus changed his mind. “At the time, I really didn’t have any concrete plans for the future, but I think it was because I hadn’t found a place that stood out to me. I really didn’t believe I would go back until I walked this campus,” Baughman said. While a student, he took on student-engagement activities, including creating social opportunities for commuting students, while balancing school and work. Baughman is an artist. He blends color, passion and ideas to create vibrant artwork on chalk murals, paintings and billboards inside and around Thunderground. While Baughman is uncertain about his next move, the combination of creativity and interaction with people continues to inspire him. Baughman’s parents and five younger siblings were not there to see him get his diploma, but they will be close in spirit, he said. Bruce Ploeser graduated today, but he’s not going anywhere. At least, he hopes not. 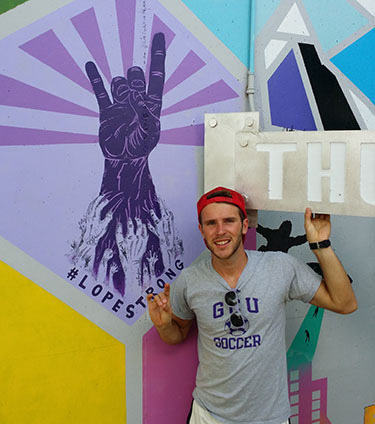 Ploeser, who earned his bachelor of science in biology with an emphasis in pre-physician assistant, wants to keep studying at GCU with an eye toward earning additional degrees. He also wants to work as an enrollment counselor or an instructional assistant for chemistry. His end goal? To become a professor of chemistry. Bruce Ploeser found his purpose at GCU: to further his education while helping others further theirs. It’s a significant shift since Ploeser’s transfer more than two years ago from Estrella Mountain Community College, when he had his sights fixed on becoming a P.A. “Through working in the Learning Lounge and my experiences empowering students to understand the sciences, I have decided to change plans,” said the 22-year-old. Those plans might be temporarily hindered because GCU doesn’t offer advanced degrees in chemistry – at least, not yet. But Ploeser is a believer, and he believes the University will offer those and many more in the near future. “The number of degrees has increased, especially with the rise of CSET, which I think is every exciting,” he said. Ploeser said teaching at the Learning Lounge was a major part of his GCU experience, as was working with Dr. Joe Veres, director of K-12 outreach programs. Ploeser began working at the Learning Lounge in September 2014 as a science tutor. “The concept is not that we are helping students who are deficient. We are here to help students who want to succeed more,” Ploeser said. Ploeser’s favorite class was organic chemistry, a challenging yearlong experience that was improved by collaboration among classmates. He enjoyed Dr. Will Primack, a CSET professor who helped Ploeser learn who he was as a person. Ploeser also appreciates GCU’s Christian roots.